With the warmer weather comes a season of fun in the sun for both humans and their pets, but summertime is also fraught with danger for our animals. 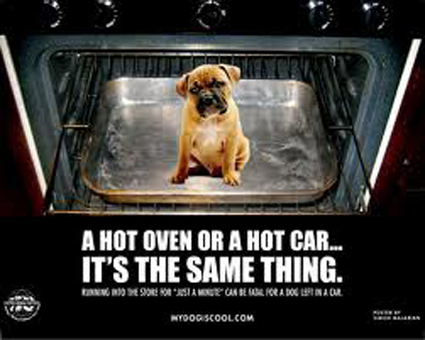 Every year, dogs and cats die in overheated cars and from other avoidable situations. Don't let this happen! Heed the following tips and how-tos to help keep your pets safe and cool this summer. Watch out for signs of overheating. Dogs and cats can easily overheat and get sick in hotter weather. Since dogs and cats can only control their body temperatures through panting, it is hard for these animals to stay cool in hot weather. Though their paw pads can release heat, it is difficult for them to do that while they are standing on a hot surface. (See 10 Tips To Protect Your Dog's Paws From Hot Pavement.) Dogs are most vulnerable to hot weather, and can quickly get overheated and get heatstroke or worse if not treated quickly. 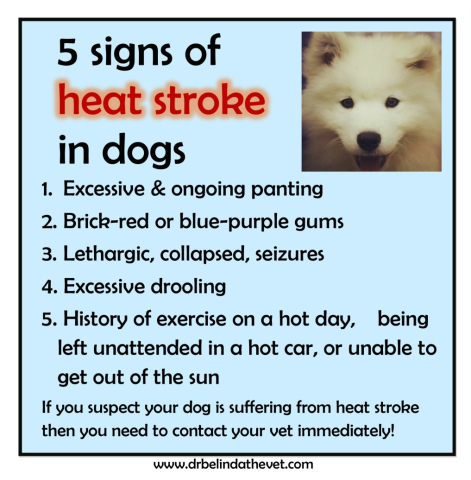 The signs of heat stroke include heavy panting or rapid breathing. 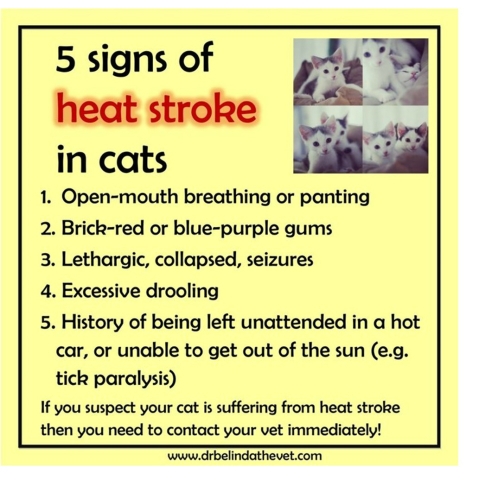 Along with this, your pet could also be excessively hot to the touch, have an increased heart rate, have glazed eyes, be drooling excessively, have dry gums that turn pale or, in more severe cases, be staggering or stumbling, vomiting, unconsciousness, having seizures and/or diarrhea. 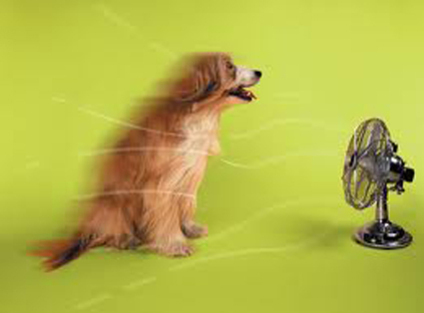 If your dog or cat gets overheated, you need to quickly cool him down. Rush your pet to a cool place, put him in front of a fan, rinse him with cool, not cold, water, wrap him in cool towels and, if necessary, rush him to a vet. Canine and feline overheating can become life threatening without immediate treatment. Don't use ice cubes or ice water to cool your pet as they may shock to their overheated conditions. You may want to double check to see if your breed of dog or cat is more susceptible to overheating so that you can be more watchful for possible problems. For example, older, obese, or short-nosed flat faced dogs (Boxers, Pugs, Pekinese, Bulldogs, Shih Tzus, French Bulldogs, etc.) are less tolerant of heat. Persian cats, because of their flat faces are also susceptible to problems associated with heat because they cannot effectively pant. Also, very young pets, senior pets, and pets with health issues tend to be more susceptible to hot weather. Persian cats, because of their flat faces are also susceptible to problems associated with heat because they cannot effectively pant. What most people don't realize that on a mildly warm day in the 80s, the inside of a car can go up to 100 °F or more in just 10 minutes. On a hot summer day, it just takes a few minutes for the inside of the car to heat up to over 120 °F. Even if you leave all of the windows cracked open, a hot car can be perilous to the safety of your pet and can lead to a fatal heat stroke. In some states, leaving pets unattended in cars in extreme weather is illegal and can subject you to fines of up to $2000 . Even if you only plan to be out of the car for just a few minutes, please don't leave your pets in the car anytime the outside temperature is over 60 °F, even in winter, even with the windows cracked, and even in the shade. (source) Car interiors get too hot for a pet in a very short time. A short delay in your getting back to the car quickly can be fatal to your pets. If you can, avoid walking your dog during the hottest part of the day when the sun is out. Instead, try to walk him early in the morning or after the sun sets in the evening. When you do take your dog for a walk, be careful to avoid burning his paws. Here's some great Tips On Keeping Paws Safe In Hot Weather. When going outside, you may want to have this great evaportive cooler vest to help your dog keep cooler in the summer. Don't use ice directly on your pet; it could lead to shock. You may want to save money by turning the air-conditioning off during the day or whenever you are not home, but you must never forget that you have creatures living there that can be dangerously affected by hot temperatures. Instead of turning off the air-conditioner, leave it on to a slightly higher yet still comfortable setting (perhaps 80 °F) while you are out during the day. 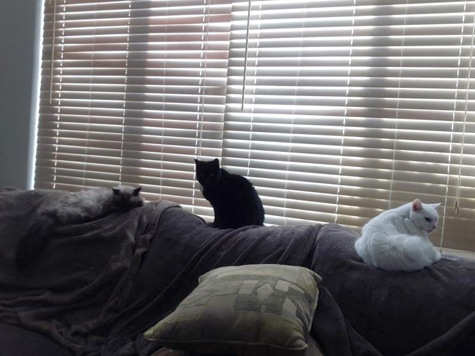 Also consider closing the curtains to minimize the sun coming into the house during the day. 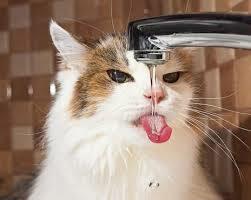 While it may seem obvious that you need to give water to your pets, many animals die every year from dehydration. Your pets will need double the amount of water during the warmer months of the year because water will help them cool down and dispel heat through panting without dehydrating. To nudge your pets to drink more water, a constant fresh water supply can be helpful, as can a few spoons of chicken broth in their water! Here's some suggestions on some of the best indoor and outdoor pet fountains to help you give fresh water to your pets. If your pets are outside during heat waves, make sure to place water bowls in shady areas and to add ice to your pet's water whenever possible. One easy trick is to use a small bowl to make a solid block of ice (blocks of ice last longer that ice cubes) and put the ice in an extra large bowl along with water so that the water will be chilled longer. Dehydration and heatstroke can occur within the blink of an eye. Any cat or dog that is outdoors in stifling temperatures must have access to good shade along with plenty of water. So check carefully that if your pets are outdoors, make sure that your pet will have adequate shade throughout the whole day. If there is not sufficient natural shade, think of getting a good sun canopy or quick pop up tent that does not restrict air flow to provide some respite from the heat. They are not expensive and well worth it for providing quick and easy shade. An elevated bed with a built in cooling shade like this one by Pawhut is a great option to provide protection for your dog from the hot ground and the hot sun. If you are relying on a dog house to give your dog relief from the heat, please know that most dog houses do not provide either shade or relief from the heat. They are more like ovens since they rarely have sufficient insulation or air flow. Also, don't ever tie your pet to a deck or porch if the he won't be able to meander to a shady spot. And don't restrict your pet to driveways or other surfaces that quickly become scorching hot. Dog and cat paws are very sensitive to the heat. These pets are are also at risk for sunburn. If you don't have a swimming pool but do have room for a mini play pool, consider buying an outdoor pool for your dog to play in and cool off. (If your dog can't swim, keep him away from your swimming pool at all times, unless he is jacketed.) When choosing a pool, buy a hard, plastic wading pool made especially for dogs. 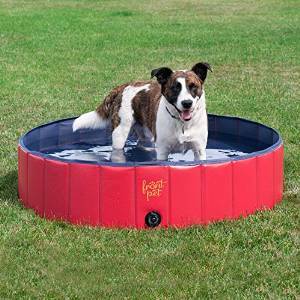 This pool from Frontpet gets excellent reviews. Best not to purchase a cheap kiddie pool because they tend to break easily and get holes in them from eager paws. Your dog will really enjoy keeping cool by having his own pool! Whenever you can, take your dog out to the pool, the beach, or any other source of water to cool off and play. It can be a great way to exercise your dog and give him a chance to cool down naturally. Just remember when playing in water that most dogs will need a water safety vest if the water is more than breast high. Always watch your dog if he's playing in a pool, lake, or beach. You can check here for the best water safety vests for dogs. 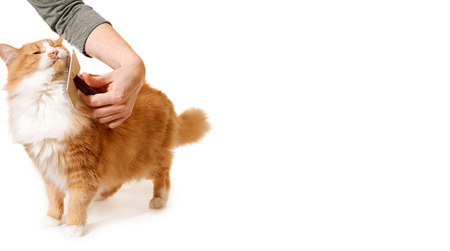 For both cats and dogs, tangle-free coats will keep your pet cooler in the summer. Brush your pets more often than you normally would. Our current favorite dog and car hair brush is this one from Chirpy Pets. Get some fans and cooling mats to help your pet cool off. Cats and dogs both enjoy the breeze of a fan. 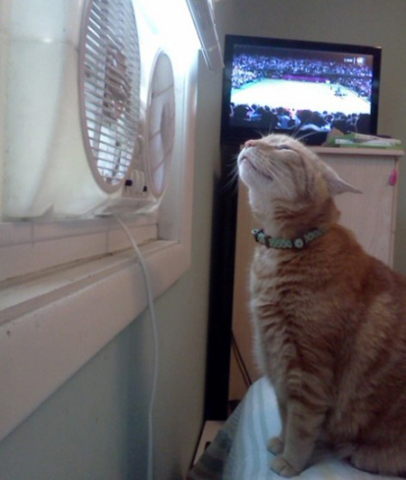 Whether it's the sound or the feel of the air passing, your pet will almost always gravitate towards a fan. Make sure there's no danger involved and that the animal can't get caught in the the grooves within the housing of the fan. I like the Lasko line of fans because they take up only a little floor space and won't harm my pets. To make your home extra comfortable for your dog or cat, think of making a cooling bed for your pet. Cats will naturally gravitate to a comfortable cool spot in your home, be it a tiled floor or spot near the air-conditioner or fan. Wrap a packet of frozen peas or a fridge gel pack in a towel or under your cat's mattress to create a cool zone that conforms to your cat's contours. Or, better yet, you can try a cooling mat like this pet cooling mat to help your dogs and cats stay cool. It is activated by your pet's weight, so you don't have to worry about refreshing it. Lots of the chemicals used commonly around your home in the summer can be poisonous to pets. Things that you may not normally worry about like sunscreens, mosquito repellent, and citronella can be toxic to your pets. So before you use something that may have toxic chemicals, make sure to read the label carefully. This is particularly true if you use lawn insecticides or rodent poisons of any kind because pets can easily come into contact with these toxins. Product instructions will indicate how long after application it will be safe for your pets. Whenever you are in doubt, always take precautions to keep your pets away from potentially toxic substances. You should also be careful of outdoor plants. Some plants like these can be toxic to your cats. 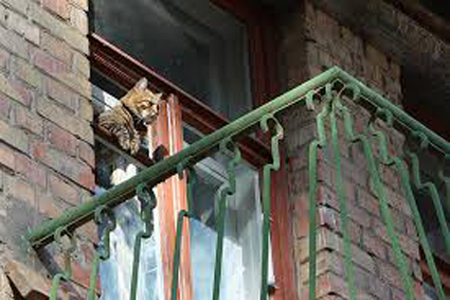 Cat in high rise building: Source:bdaviso15.wordpress.comHigh Rise Syndrome occurs during the warmer months of the year and affects mostly but not exclusively cats. In the words of Dr. Murray: "...Cats fall out of windows or doors and are seriously or fatally injured. 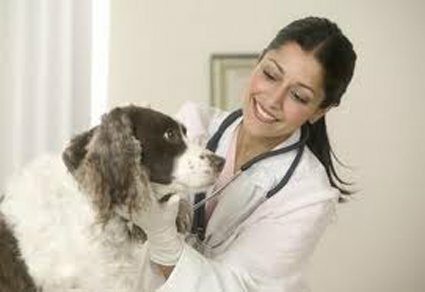 Pet owners need to know that this is completely preventable if they take simple precautions." Just check your window screens and add some additional screws and hardware to keep them strong and secure. Your pets will need a full veterinary check-up as the summer approaches, which should include a heartworm test and a plan for flea and tick protection. Even though there should be some consideration for these issues all year long, the summer months present a critical challenge that must be addressed. For the most part, common sense will get you and your pets safely through the summer. Still, one axiom always applies: An ounce of prevention is worth a pound of cure! Happy and safe summer to all creatures great and small. Originally published July 2014 and updated April, 2017.